Beyer was the first casualty of the congressional team at last year’s contest. He still remembers his streak-ending error. “I lost last year on a word that I had never heard before, and promptly learned and forgot: ‘Allomorph.’ You can get annoyed with yourself when you know it, but if you don’t know how to spell a word you don’t know, you’re more forgiving,” he said. 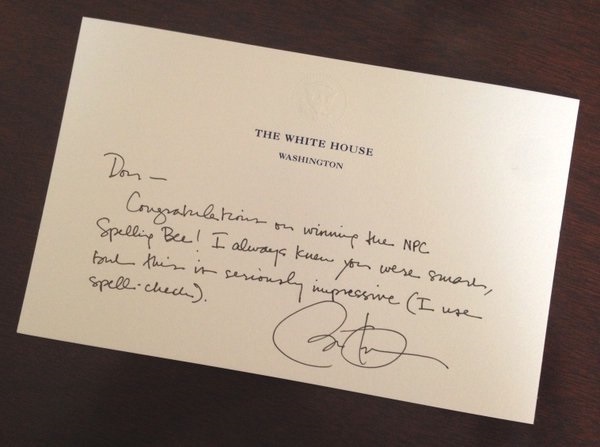 In 2015, Beyer’s winning word was “apostasy.” President Barack Obama wrote him a letter at the time congratulating him on his win. On that sixth grade loss, he said, “Afterwards, when they told me how to spell it, I said, ‘Hey, you pronounced it wrong,’” because he couldn’t believe the word was pronounced that way. Beyer was also wrong on ‘address’ once in a spelling bee as a student, because he spelled it with one ‘d.’ Later, when he was learning to speak German, he learned that it’s spelled with one ‘d’ in that language. “I was correct, but in the wrong language,” he said. So, is the two-term congressman and former Virginia lieutenant governor studying for this year’s bee? “How do you study 3,000 pages?” Beyer said, citing the length of the dictionary. He said his best shot is to “trust a lifetime of reading.” But spelling is now always on his mind. While members of both parties are invited to represent the politicians’ team, only Democrats competed last year. But this year, Beyer will be joined by at least one Republican: North Carolina Rep. Virginia Foxx. Other confirmed participants include Reps. Suzanne Bonamici of Oregon, Ted Deutch of Florida, Scott Peters of California and Jamie Raskin of Maryland. He may try another tactic this year as he attempts to gain back the title. “They do serve alcohol and I think this year I will have a drink beforehand,” he said.